[tps_footer]Aditya Roy Kapur and Katrina Kaif are vesting all their time and energy promoting their upcoming next, Fitoor. The leading pair of Fitoor were recently in Ahmedabad for promotions. During their travel, they spotted a local famous shop serving the delicacy of Ahmedabad, Ghatiya. Both the actors, without giving it a second thought, gave in to their craving and relished some delectable food. 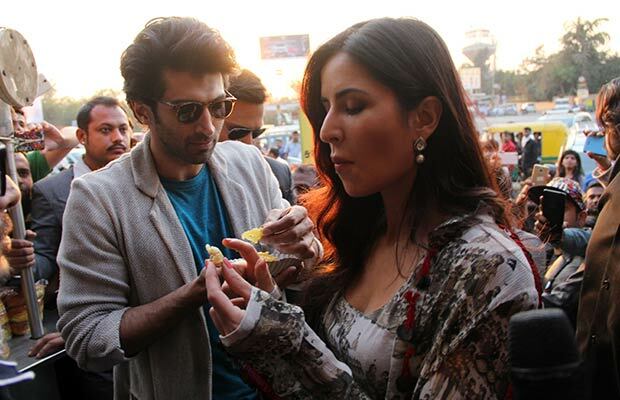 During their cheat meal, Aditya who is flaunting a lean look for Fitoor shared that food is his Fitoor in real life. Fitoor is a love story about a rich girl and a poor boy and will feature Aditya Roy Kapur opposite Katrina Kaif together for the very first time on the silver screen. Previous articleAirport Diaries: Aamir Khan, Chitrangada Singh, Vinod Khanna And Others Spotted!